This mint chocolate syrup is rich, luxurious and delightfully sweet. Paired with a refreshing minty twist, it is truly irresistible. Mint and chocolate is a contrasting combination that works perfectly and is a great addition to so many recipes. 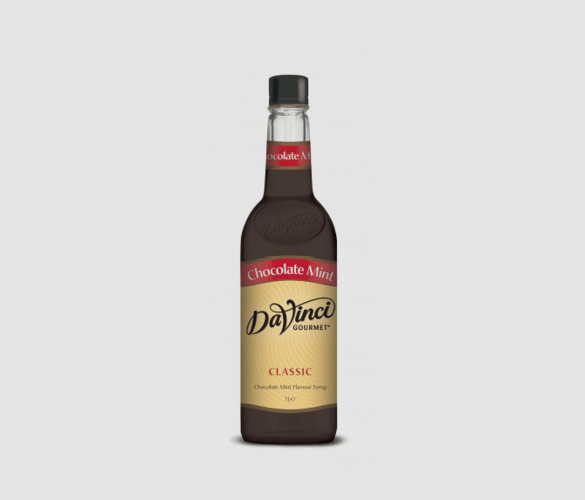 Experience an authentic chocolate taste and an exhilarating, cooling minty flavour. This syrup will compliment so many of your favourite food and drink recipes without overpowering them. Experiment with flavours and measurements to see what works for you and your preferences. Where Can I Buy Mint Chocolate Syrup? Rely on this product to deliver a gourmet taste with every use. DaVinci are dedicated to using only the highest quality ingredients, such as pure can sugar, which is what gives their products this luxurious quality. This product has been specially formulated to dissolve seamlessly into hot or cold beverages. This product will give you ultra-smooth and delicious results. It works to give an even flavour, avoiding the syrup being left at the bottom of your mug. This is a great way to guarantee quality for your customers, friends, family or yourself. This formula has also been specially formulated to resist curdling against dairy products. This can be an issue with some sweetening products on the market, however be assured that this syrup will not let you down when it comes to quality. This product is a great way to expand your menu and create some excitement in your coffee shop. Not only will it give customers and baristas so many new options for their beverages, it is also a safe product that won’t cause any dangerous situations in the kitchen. The plastic user-friendly bottle is much safer than glass products, meaning no nasty spills or accidents. We know how busy coffee shops can be so choose the safer option to avoid a dangerous environment. This recipe is for a delicious mint mocha. The combination of mint, chocolate and coffee is so indulgent and is the perfect treat. With the addition of these syrups, it is also surprisingly easy to recreate at home. Grab your favourite mug and fill it with hot water to keep it warm. Brew your coffee or espresso shot. Pour out the water and combine the syrup and coffee in the mug. Steam the milk. If you don’t have a steamer, you can shake the milk vigorously in a cup with a lid on and then put in the microwave for a few seconds to stabilise the foam. Top with whipped cream, a drizzle of syrup and a sprinkle of chocolate chips.